I went to Burning Man with a completely different goal this year, at least from a photographic point-of-view. In the past I created portraits of the participants. This year I only had three days and wanted to do something different. One of the 10 Principals of Burning Man is Radical Self Expression. This year I focused on the art, which is incredible, crazy, kinetic and (literally) incendiary. There are sculptures that incorporate amazing LED light shows standing amongst the dust and beauty of the Black Rock Desert. One of the most impressive ones this year was the statue called Truth is Beauty by Marco Cochrane. The statue is 55 feet tall and was transported in three sections to Black Rock City (photo top). There are wooden structures meant to be burned before the end of the week. This kind of commitment to put all that work into a project and then have it go up in smoke is a kind of beauty in itself. The cheers that go up as a work burns are applause for the artist and the commitment to one of the other 10 principals, Immediacy. The Church Trap (photo above) was a small church built as a box trap. Inside were pews and a working organ. From the organ sprung sheet music mimicking the way one might imagine actual music emanating from the organ. Many times during the week I heard amazing music coming from the church. A man played Bach. Another led a crowd of 200 people in Lean On Me. I spoke to one man who was even getting married there. Talk about metaphors on metaphors. 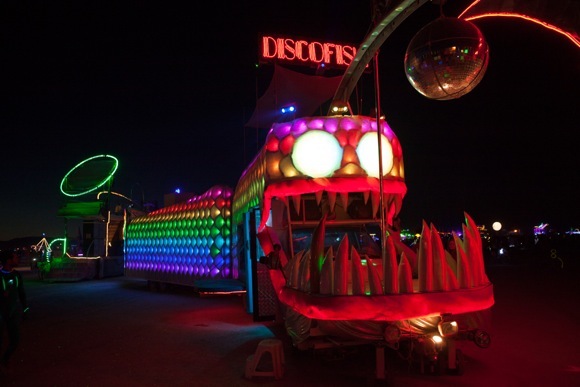 Probably my favorite art pieces are the kinetic structures known as art cars. These cars are built on old car or bus chassis, like the Discofish shown above, engineered by a team at Nuvation. Smaller ones are built on golf carts. The most impressive ones serve as transportation around the Playa for the many participants. With lights ablaze and music blaring, they park in the desert and become beacons for the dancers and revelers and photographers. One of my favorite memories is a dozen art cars and thousands of people massed around Truth is Beauty dancing to music pouring from the cars. In the Deep Playa a mile or two from the main action, the Burn gets much quieter. Not as many people are there — and projects spread far apart. Peaceful interaction is the norm. 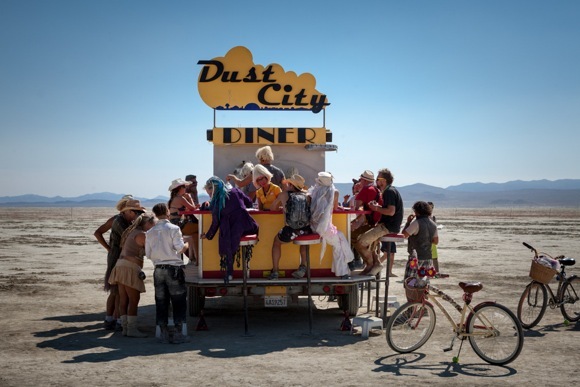 My favorite Deep Playa installation was the Dust City Diner (photo above). Men and women dressed as waitresses in blonde wigs served up grilled cheese sandwiches and bourbon. Everything is no charge, of course, because Gifting is another of the 10 principals. You don’t charge for anything. Not even a trade. The gift is unconditional. The two main installations and burns are The Man, which burns on Saturday and the Temple, which burns on Sunday. All week the man stands in the middle of the festivities. You can climb the platform for a great view of the Playa and surrounding art. This year’s man rotated above a wooden flying saucer. On Saturday the crowd gathered with all the art cars making a circle around the people who in turn surrounded fire dancers spinning fire. After an amazing fireworks display, an explosion set him ablaze to the cheers of the crowd. This year’s man was a particularly spectacular burn. 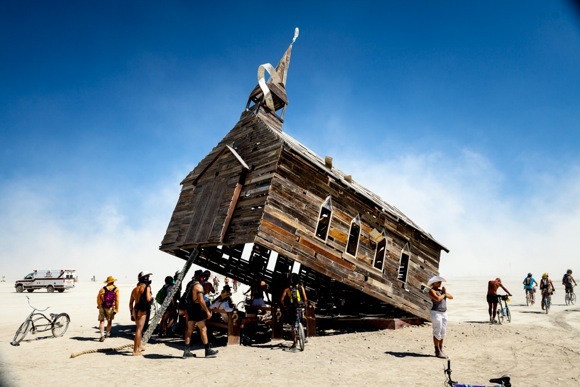 The temple is the spiritual center of Burning Man and is situated above the Man before the Deep Playa. This year’s temple was called the Temple of Whollyness. 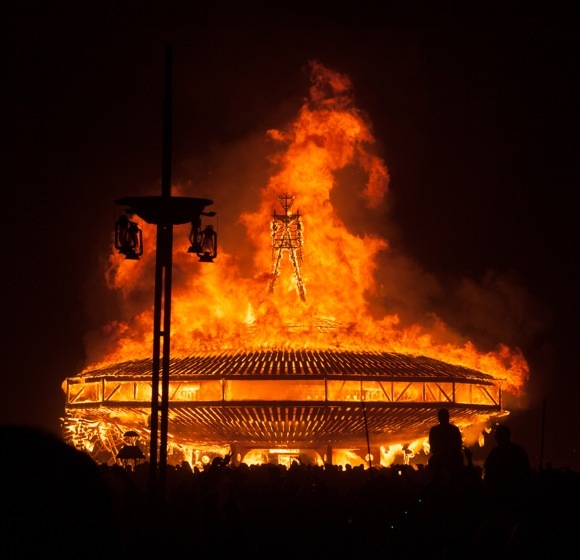 Burning Man is not a religious event. But many feel a strong spiritual pull. The temple is a place where people meditate, pray and leave memorials to those that have passed. The temple was a pyramid made from geometrically interlocking wood pieces fit together without the use of nails, glue or fasteners. My shot here shows the temple at night as an art car passes by. There are many more cars, statues and photos that I cannot show here. If you would like to see more, you can see my Flickr Gallery with photos from the past 4 years. 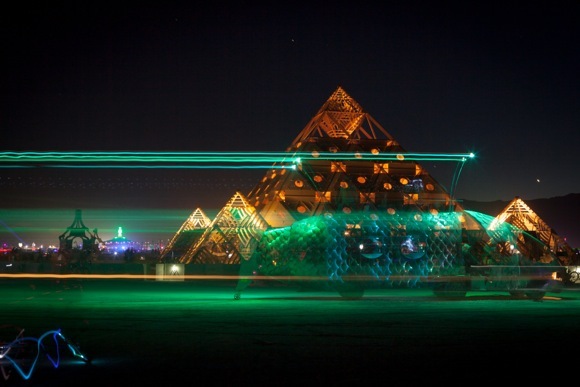 I still get shivers when I see these photos reminding me of the absolute awe of spending those beautiful nights in the desert with the sounds of the sound camps filling the night air, the art cars whizzing about and people with their LED encrusted bicycles buzzing about like bees. The fact that 65,000 plus people can spend a week together in the desert and almost everyone comes away happy and changed for the better, is a testament to the 10 principals and even more of a testament to what people can accomplish when they have a common goal. Scott R. Kline has been a contributing photographer (and occasional writer) to InMenlo since 2011. Thanks for the photos and wonderful details of Burning Man that allow us to be there from here. A gift for today.